Not being able to attend International Consumer Electronics Show (CES) this year, I have been monitoring YouTube pretty closely this week to see what new gadgets are being launched. This year, there is a bunch to be excited about. As the father of a toddler, there is one device that really caught my attention and I just had to share. 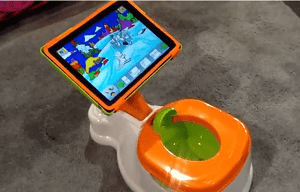 iPotty from CTA Digital is simply a potty training toilet that has an iPad dock attached. I guess you would use the iPad to distract your child and possibly occupy their time while they are attempting to do their business. You could even pair it up with one of the many Potty Training apps to make the iPad part of the training process. I have seen a number of pundits giving this concept bad reviews because of the “gross” factor. Seriously, I would wager that the majority of these glass housekeepers have read an article or two in the WC. I am about 6 months out from my first potty training experience, so I can’t speak with authority to the utility of the iPotty. My biggest concern would still be keeping the iPad clean and in one piece Yes, there is a splashguard that encloses the iPad, but my life over the past 16 months has been dedicated to trying to save devices that I didn’t expect my son would be able to get at. Toddlers have a natural drive to destroy just about every earthly possession a parent enjoys or values and they have an uncanny ability to overcome any obstacle that may stand in their way. That said, it is a very interesting concept and who knows, in 6 months, I may be popping in to my local Babies R Us to check out their iPotties. Here is a quick video from cnet that shows off the iPotty at CES.